The Model 775 Slimline Open Triple Mag STX Pouch from Safariland holds contents face-out to save valuable space on duty belts, fitting three magazines in the space normally taken up by a dual magazine pouch. The 775 is crafted from durable and rigid SafariLaminate® STX and comes in a choice of five different finishes well-suited for uniform wear. Retention screws between the pouches allow for custom set levels of tension according to user preference. Its open-top design provides rapid access to contents, saving valuable time when reloading. The pouch features horizontal and vertical belt slots for versatile mounting options and fits a 2.25-inch wide duty belt. Excellent mag retention yet easily accessible. Excellent fit and finish. Middle magazine a little tight. I only have 1 complaint about this mag pouch. When you tighten the retention screws to hold in your outside 2 mags, the center slot becomes very tight and difficult to get your mag in and out. Good mag pouch. Rigid and provides for fast reloads. Wouldnt have any other style of mag pouch on my duty belt. Awesome, very much needed duty gear in our world today. Doesn't take up much room on the duty belt. The outer mag keep a rework on tension. It's a good mag pouch. Adjusts well to different caliber mags but unfortunately the more you adjust it, it makes the mag in the middle fit very tight. Looks great though. My favorite mag pouch, it's nice and simple and easy to adjust. Yes the middle mag is a lil hard to pull out depending the belt your using other than its perfect. These are a plus for a duty belt, an extra single stack mag wout taking up any more belt space. No flaps to mess with either. Fits snug, adjustable, retains well. Great minimal pouch. Same space if not less than a covered double mag pouch for a glock. Very sturdy and scratch resistance. Slight adjustment needed for fit but that what the tension screws are for. I was a little worried about the extra weight of an additional loaded magazine but this feels fine. The mags are spaced well so fat fingers can draw quickly. Great retention and accessibility. Fits great on the duty belt and is comfortable. I would definitely recommend this product. Perfect fit and love the open top mag holders. Perfect when carrying single stack magazines, like the 1911. the triple single stack mag pouch is similar in size to the double double stack mag pouch, like the Glock. Item secures magazines very well. I'll give it 3 stars for now. It may be due to positioning on my duty belt, but the middle magazine is very tight while the outer magazines fitment is acceptable. Adjusting the screws doesn't seem to fix the problem. I'll continue to adjust the screws and get the holder broken in. The issue isn't bad enough to send the item back. Great products fits my magazines perfectly. I bought this for a pistol gunfighter class. It worked perfectly throughout 3 days of shooting. I would not hesitate to carry this in the Middle East or in law enforcement. Excellent product It is a nice feeling having 15 more rounds readily available on my belt. As far as looks, it fits right in with the rest of my gear. Got these to speed up my reloading time when qualifying at work. They work great Also allows me to carry more ammo using the same space on my gun belt as my old 2 Mag closed holder. 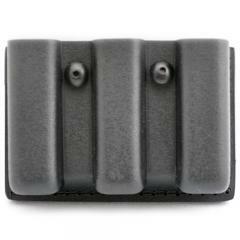 Glock 3 clip holds clips tight without restricting fast access, snugs up in belt well.